Jerry Seinfeld is quite a character. The stand-up comedic icon who changed network TV success with “a show about nothing” has also pioneered another brand of media stardom: the online video platform. Seinfeld’s hit Crackle series Comedians In Cars Getting Coffee has not only put him back on many people’s radar, but it’s also one of the most watched video channels in an age dominated by subscription services like Netflix and Hulu. Jerry knows quite a bit about the DIY route of carving your own unique path, very similar to what artists and entrepreneurs do with their craft. While he may be a prominent entertainment figure, Seinfeld started from the ground up in New York, working comedy clubs until he made it with features on late night TV shows, leading up to his monumental network show Seinfeld. The new online series showcases some of America’s greatest entertainers and comedians, and does so in a new light. Instead of illustrating their latest project, movie, tour or book, the whole episode is geared towards shining a light on personal communication and interaction. Jerry and his guest drive around in a car (usually a historic or premium vehicle) and chat about the current state of comedy, the country, and some of their pet peeves. Then they go get coffee. If anything, the series is a subliminal ad for coffee with nicely done cutaways that should make you want a cup of Joe at some point in the episode. This is Super-Fan-dom at its best. Seinfeld isn’t just a comedian who has found success. He’s a student of the game, and his studies involve sitting down with others to find what makes them tick, what brings a laugh out of them. Most of the conversations and interactions are enlightening in some capacity, with standouts including Kevin Hart, Alec Baldwin, Jon Stewart, and Amy Schumer of the latest season. Seriously, you need to watch this series for more than just a good laugh. Jerry is a comedy super-fan and his interest in the field is a part of everything he does. There are plenty of things we as artists, entrepreneurs, and even coaches can learn from one of the world’s most humorous people. What shouldn’t go unnoticed is the power of Jerry as a super-fan, not just an entertainer. 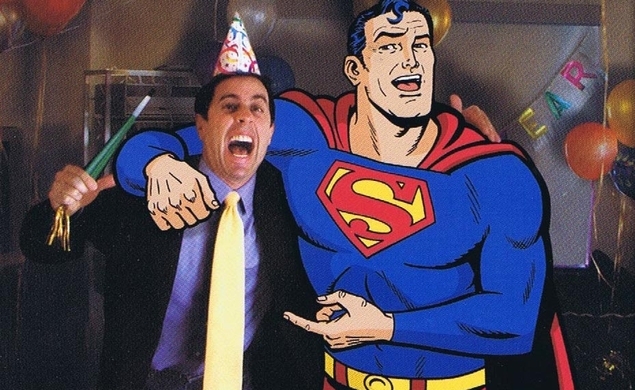 Fans and viewers of Seinfeld the show have to acknowledge the strategic placement of one particular fictional icon in each episode: Superman. It’s no secret that Seinfeld has a bit of a man-crush on the world’s first comic book hero. He also did a brief series of web ads for American Express featuring a cartoon version of Superman that was voiced by Patrick Warburton (David Putty in Seinfeld). The point of illustrating the power of a Seinfeld super-fandom is to illustrate how the super-fan mind works. A super-fan will incorporate the work, creation, imagery, and representation of the ones they are following into their personal and professional work. Their love and super-fan following becomes a part of who they are, what they are drawn to. Showcasing that love and appreciation is just a way for them to celebrate life. Who wouldn’t want one of entertainment’s greatest stars to be so in love with their work that they showcase it in some form or fashion in a product that is beloved and known the world over? This is the connection that can be made by nurturing a core group of your audience base. Their support of your work isn’t something you ask of them, it’s something they do on their own accord. Everyone benefits from this kind of support.